Any one of many beautiful Newport Beach vacation rentals will put you right in the middle of Californian beach culture. Rent a beach house and live the glamour of Southern California near the homes of the rich and famous in this popular beach town that has become the setting for many well-known movies and TV shows! Learn more here! Best Oceanfront Property In Newport Beach, Ca. Newport Beach is located in Orange County along the beautiful Pacific Ocean, 45 minutes south of Los Angeles, 90 minutes north of San Diego, and 30 minutes away from Disneyland and Knot's Berry Farm. Any one of many beautiful Newport Beach vacation rentals will put you right in the middle of Californian beach culture. Rent a beach house and live the glamour of Southern California near the homes of the rich and famous in this popular beach town that has become the setting for many well-known movies and TV shows! Newport Beach is a small city in Orange County, CA, about 30 minutes south of LA. 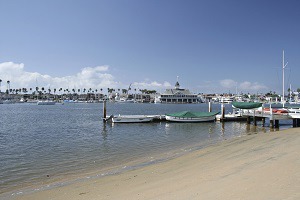 A famous beach destination, Newport Beach is the perfect place for any vacationer looking to experience "OC" life. Newport Beach has perfect weather year-round. 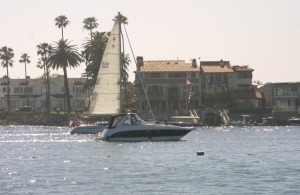 Vacationers in Newport have access to the best places for shopping California can offer, along with the best beaches. Shop, surf, and have fun in the sun at your Newport Beach house rental! Explore the Back Bay - Rent a kayak in Newport Beach and explore the waterways of Newport's Back Bay, Orange County's own slice of wilderness. Rent a Duffy Boat - These small electric boats are cheap to rent and easy to control. Grab a boat and zip around the harbor! Get your Shop On - Shop like a celebrity at Fashion Island, Orange County's most selective shopping center. With ocean views and high-class stores, you can be at the height of fashion in a trendy locale! Go to Disneyland - Newport Beach is about a 20 minute drive from the "happiest Place on Earth". Buy day passes for you and your family, stay for the fireworks, and drive home to your beach house! Find a Great Beach - And there are so many to choose from! Corona Del Mar is a local favorite for its large shore and mellow waves. Little Del Mar is less crowded and has tide pools to explore. Laguna Beach and Aliso Beach are 30 minutes drive down CA-1. With a Beach House Rental you can find the house that's right for you. Visit the Wedge - This surfing destination has some of the largest and fiercest waves So-Cal can offer, and makes it a choice spot for surfing enthusiasts. Considering an off-season vacation? Arrive in December and enjoy the annual Newport Beach Boat Parade on December 15th! Book your beach house today through BeachHouse.com! Want to learn more? Check out this list of the Top 10 Things To Do in Newport Beach from a local's perspective! Watch our new video about renting a beach house in Newport Beach!